As a whole, the game is a sober example of design, but one that still isn't practical enough to realise that platforming means more than arranging platforms in a line. Then we have the other problem - it not being mad enough. The original American McGee's Alice wasn't such a great a game either, but the setting gave it momentum. The setting rewarded you for each underwhelming jumping segment, fight or puzzle with a new and monstrous re-invention of a familiar character, or a new locale, weapon, surprise or cut-scene. American McGee's Alice even had what's still my favourite weapon in any game ever. The Blunderbuss was a pantomime gun of such absurd power that when you pulled the trigger the apocalyptic blast of shrapnel would kill everything in your field of vision. 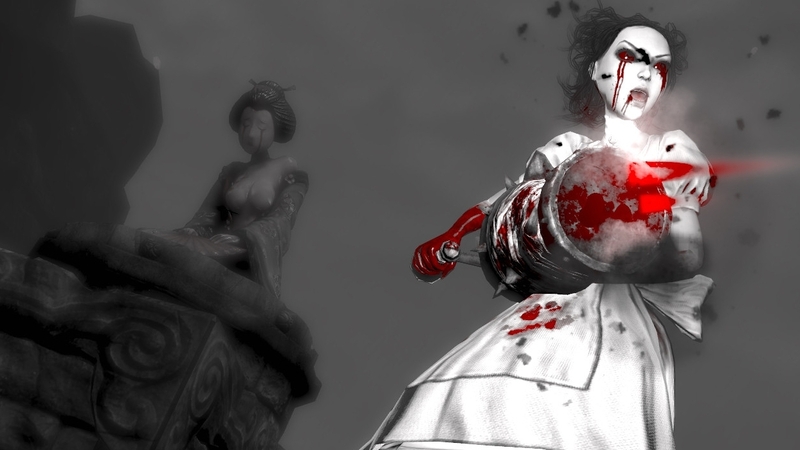 As much as Alice: Madness Returns follows in the original game's footsteps, it has none of that unhinged generosity. Your reward for finishing another rubbish jumping segment is, more often than not, yet another rubbish jumping segment. While Madness Returns looks thrilling in screens and trailers, what you're seeing there is almost all of the assets that the game has to offer (you're also seeing the PC version, which is slightly prettier than the console versions). Those are the environments that you'll see, repurposed and arranged in different ways, for hours on end. With its ostensibly wondrous setting, this game should have felt like a celebration of creativity. Instead it feels cynical and even cheap, as if it were the official game of a Hollywood movie that was never made. The strangest thing about this is that there's probably almost enough content here to make for a pacey and surprising 12-hour game - but it's all spread out over 22 hours instead, making the game's title irritatingly apt. Madness Returns? You bet it does. Those same sodding art assets, set-pieces and enemies return to you over and over again, like undercooked bits of food that aren't content to sit in your stomach. The amount of padding in this game is absolutely bizarre. If you didn't think duelling a teapot with an eye could get boring, this game will teach you otherwise. It will teach you to hate teapots with eyes. And then it will keep you behind after class to fight multiple teapots with eyes in a dozen slightly different arenas. One area where Madness Returns does try to innovate is in the brief, linear stretches of Victorian London you wander through before Alice lapses back into her fantasy world. While nothing at all happens in these short levels, you can see that the mundane objects that Alice is exposed to in real life shape the hours-long chapter of Wonderland that you're about to play through. A fish frozen in a block of ice down by the docks will make an appearance in Wonderland as a new enemy, for example. A brief glance at the East Asian art belonging to Alice's lawyer even turns into a world made entirely of asian art, with Alice climbing a jade mountain and battling samurai wasps. It's a nice idea, but like the rest of the game, it falls into disrepair after Madness Returns' opening few hours. The further you push into the game, the more the ideas feel hollow, unfinished and unloved. If you are in love with the look and theme of this game, it is in no way inconceivable that you could happily go frolicking and slashing your way through it in a relaxed, mindless kind of way. Everybody else should look elsewhere for their moody thrills. Alice? Let me tell you - she's got problems.